When Amazon opened the company’s first brick-and-mortar store in Seattle quite a few people thought, amusingly, that Amazon would go into traditional retail and would, eventually, start opening big(er) stores comparable to, say, Walmart. This wishful thinking, born out of the aspect that one own’s cost structure (stores) would thus be validated for a world with online shopping, is just that: wishful thinking. For reasons that elude me today, pop-up stores didn’t cross my mind at the time. Of course, pop-up stores make more sense for this objective. They are cheaper to set up and run than actual permanent stores. They can be easier ramped up and reduced as the company sees fit (and as the device strategy demands). And with them, Amazon is not dependent on relationships with other retailers. Once you start thinking about it, it quickly becomes a no-brainer. One interesting part about Amazon’s pop-up stores is that they are run by the devices team, not the retail team that opened Amazon’s first bookstore last year. The initiative is led by SVP of Devices and Services Dave Limp, who oversees everything from the Kindle to the Echo. Business Insider has a few photos of an Amazon pop-up store. 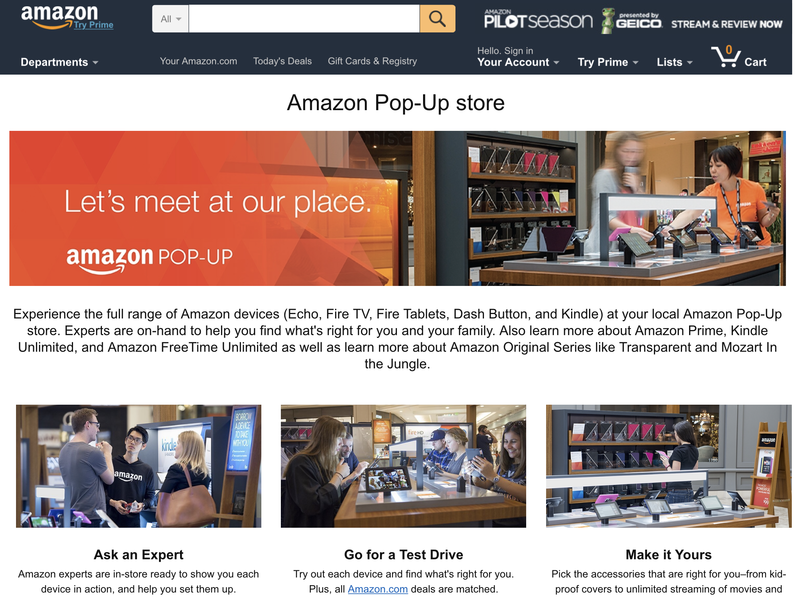 Amazon also has launched a dedicated page for its pop-up stores. This page provides a bit more information, some photos and current locations, which count 22 at the moment. You might have guessed it by now: Some will say that Amazon’s pop-up stores are just the beginning and the ecommerce giant is finally going into brick-and-mortar and thus will, finally, validate the multi-channel approach. Amazon does this, some will say, by going into the opposite direction but towards the same destination traditional retailers got lured to by service providers and consultants. The funny (or sad) thing though is that the exact opposite is happening: Amazon is doing this to expand the company’s foot print in next-gen online shopping. It is about going beyond the webshop and building out ways to shop that may not fit with every use case but that are just better for some. The customer lifetime value Amazon will get from people buying Fire tablets and Echo devices is far higher than with customers using a website in a browser. Once a customer starts ordering via voice or via TV or via Dash buttons they are far down the rabbit hole. This is as far away as one can be from a lowest common denominator strategy; while multi-channel ultimately is the latter. If you think successfully integrating a webshop, an ‘online channel’, into your multi-channel construct is hard, wait until you try to incorporate tablets and voice interface platforms and the processes that make those valuable to your customers.